Round houses described by Fletcher were common throughout the Pacific Northwest. Fletcher’s World Encompassed describes the Indian houses as dug out or into the ground a couple of feet, round and entered through the roof. Ethnobotanist Douglas Deur, Ph.D., Ecosystem Research Coordinator at the University of Washington, has said that both long houses and round houses have been common in Nehalem Bay. The Royal British Columbia Museum in Victoria, British Columbia, has a round house which is described as a typical house for the Pacific Northwest and is the centerpiece of their aboriginal display. The house is dug into the ground two to four feet and ends in a steeple style in the center with the entrance at the top and a ladder descending down into the house. These types of houses were also typical in eastern Washington and Oregon as well. The Coast Salish of Vancouver Island, Seattle and Nehalem /Tillamook/ Netarts areas were among the last tribes to settle along the Pacific Northwest coast. They migrated to the coastal areas from inland British Columbia and Montana areas. Philip Drucker’s Cultures of the North Pacific Coast states; “There is no evidence that the Coast Salish formerly had a more extensive distribution along the coast. 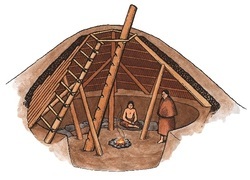 On the contrary, such archaeological data as there are from the lower Fraser-Strait of Georgia region, indicate that there at least, the Coast Salish were relatively late emergents from the interior, replacing the older coastal population.” This supports why Fletcher described round houses in Nehalem Bay.